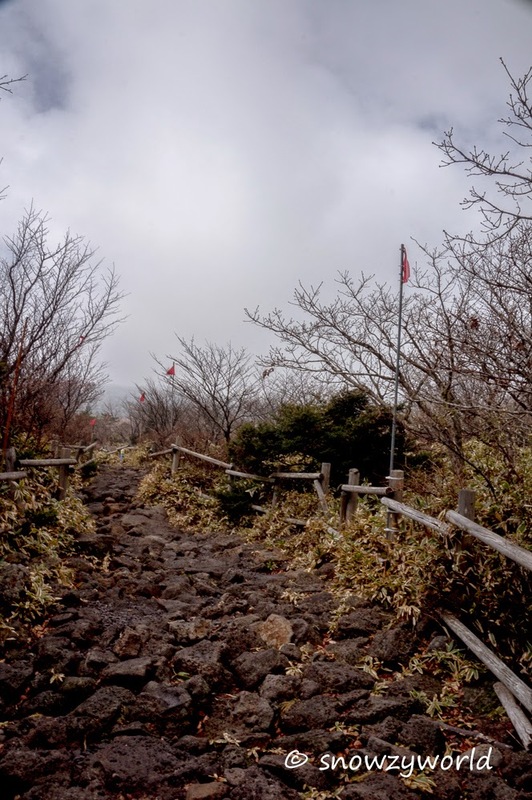 Hallasan, located on the southernmost island of the Korean Peninsula Jeju, stands at 1,950m above sea level and it’s the tallest mountain in South Korea. 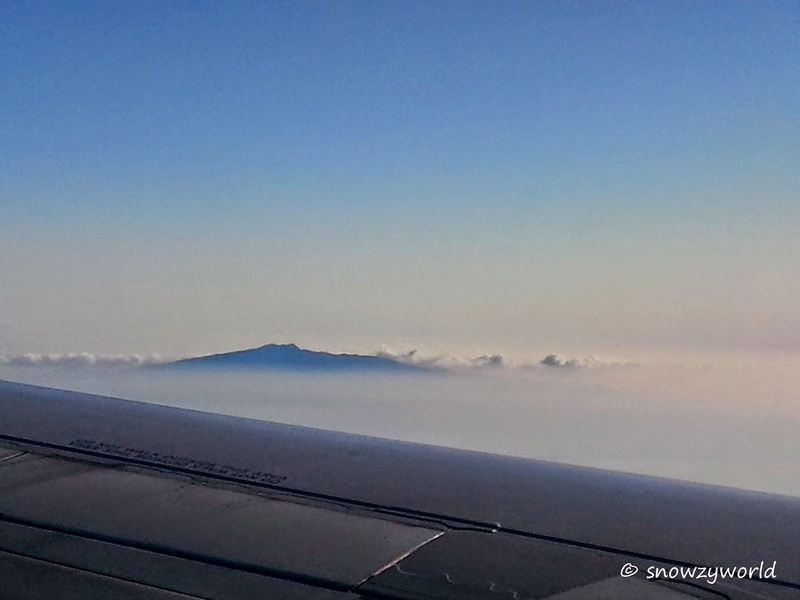 Hallasan was an active volcano until 25,000 years ago. The area of Hallasan was designated a national park in the 70s and become a UNESCO Biosphere Reserve in December 2002. You do not need a guide to climb Hallasan as the trail is well-marked and well-maintained. Entrance is free. Hallasan mountain climbing is restricted to single day climbs and climbers need to adhere to the trail access time limit. 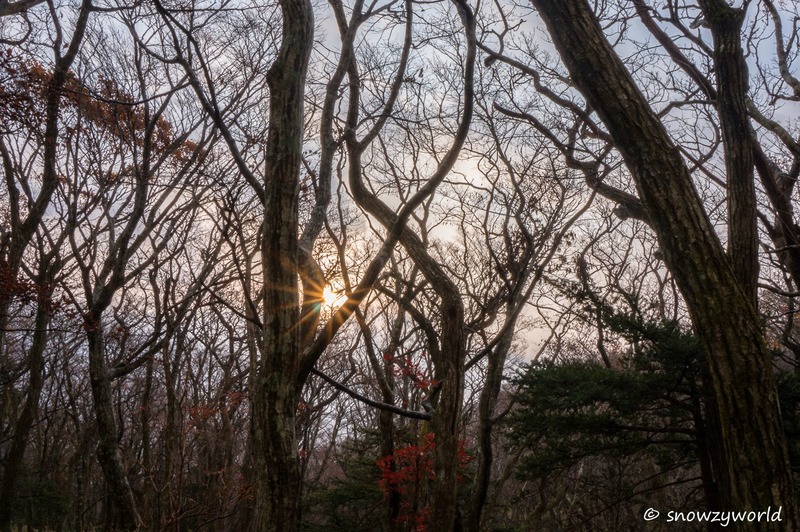 There are a few trails at Hallasan national park but only 2 trails lead to the summit – Seongpanak trail (9.6km) and Gwaneumsa trail (8.7km). 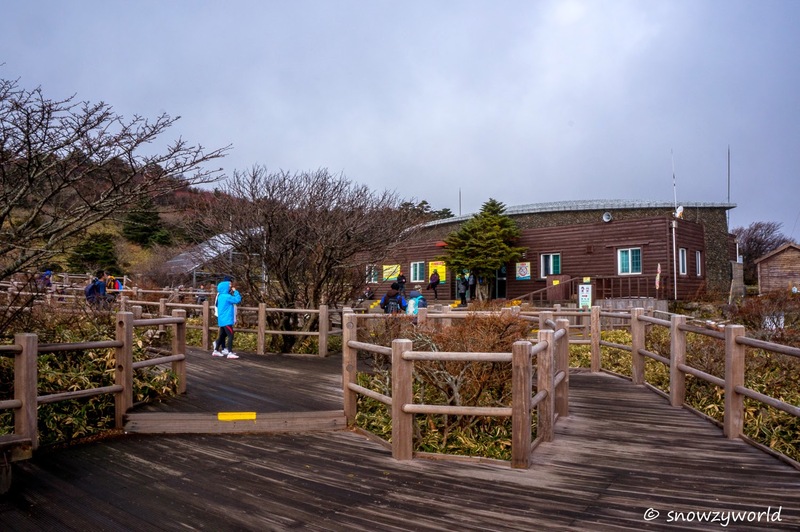 We decided to do the Seongpanak trail which starts from the Seongpanak Visitor Centre at 750m above sea level, passes 2 shelters and continues up to Hallasan Baengnokdam Lake summit. A one-way hike will take approximately four and half hours. It was drizzling on the day of our climb. Luckily it stop when we started our climb at 730 am. When we were at the Visitor Centre we saw the locals all fully geared for the climb. The 5 ya-ya Singaporeans looked really under dressed for the occasion and even thinking the locals are so over dressed for a walk in the park. Hallasan is definitely no walk in the park! 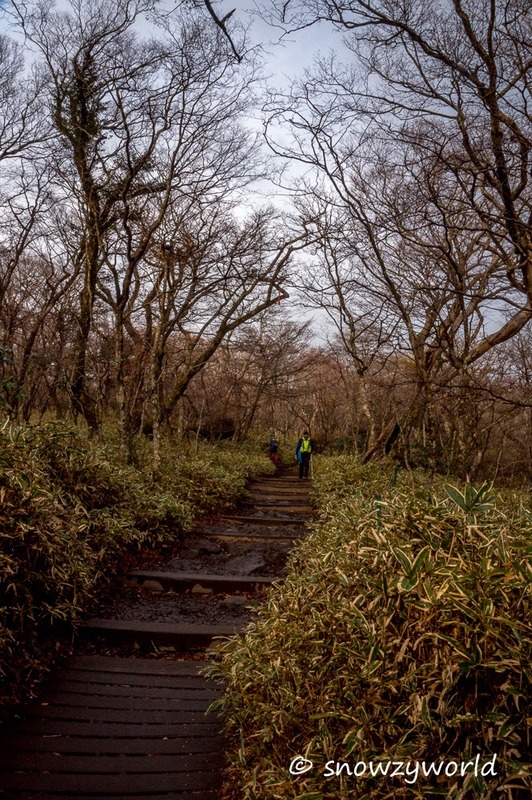 Thou as compared to Yushan, I would think Hallasan is still easier as the trail’s slopes are mostly gentle, only the slippery rocks make the climb tiring. Gradual ascent. No sweat… YET! 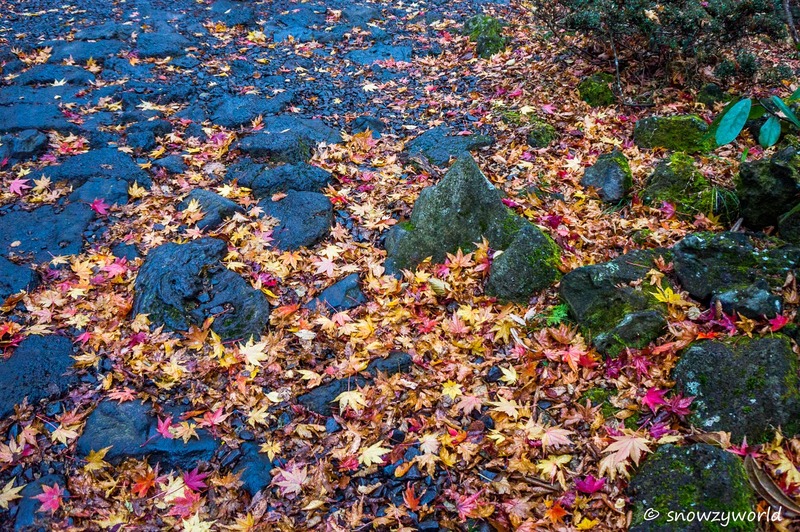 It was mid-November and autumn at Hallasan! 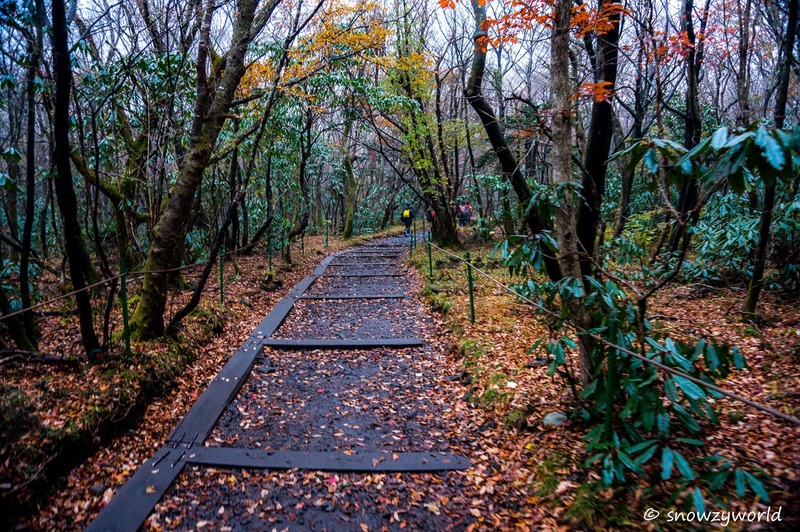 While the gloomy sky continued to threaten us on possible heavy downpour, the array of autumn red, orange and yellow greeted us at the Seongpanak trail entrance. Most of the trail is wooded while the rest are rocks. The rocks made very good foot reflexology!! Autumn red, orange, yellow.. Niceee! The trail is very well marked and getting lost is almost impossible. There are spring water along the trail for quenching one’s thirst. The 1st shelter is the Sokbat shelter. There’s a toilet there but gosh the smell of it really put me off. The next stop is Saraoreum (volcanic crater), a look-out point which suppose to provide a stunning view of Sanjung Lake. We went to the look-out point on our way down.. no lake, all dried up. 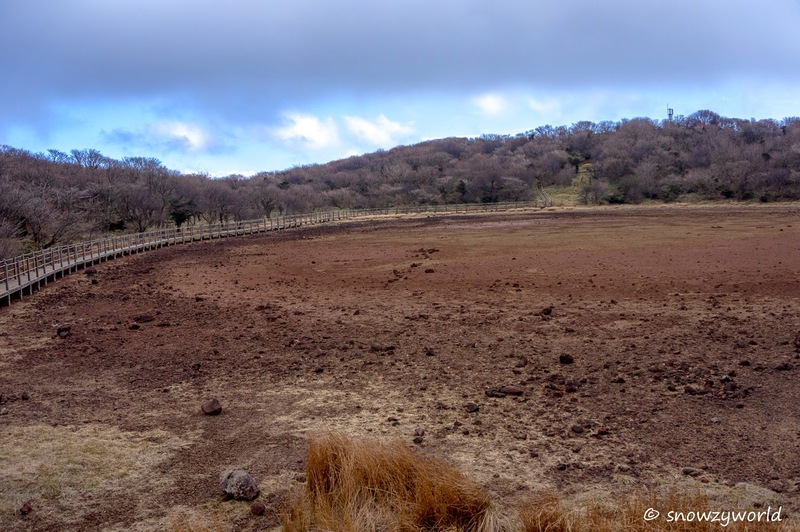 Sanjung Lake all dried up. 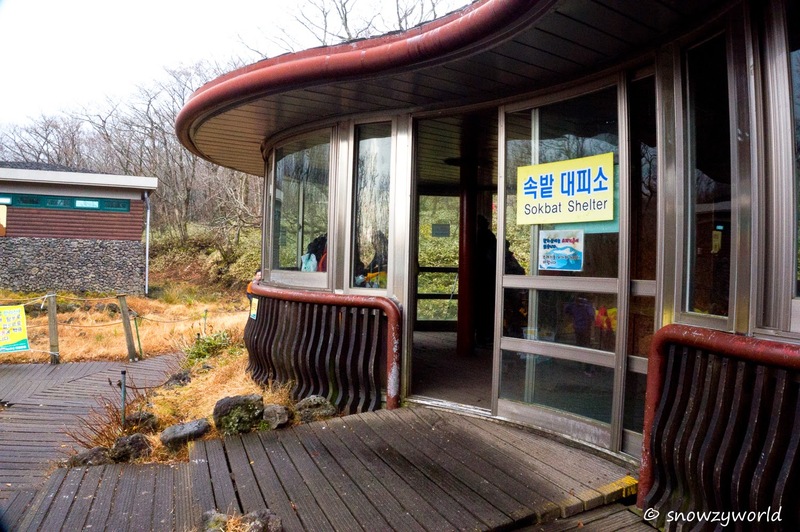 After Saraoreum, the next and last shelter will be Jindallaebat (1500m). 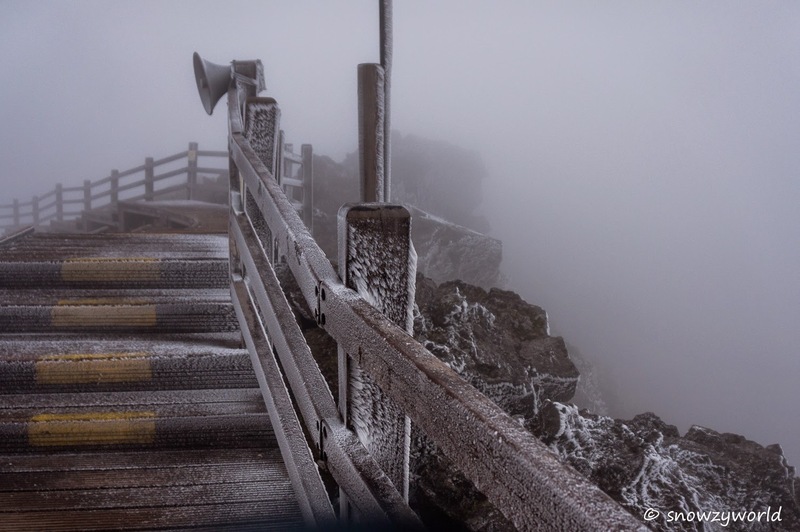 You have to reach Jindallaebat by 12 noon during the Winter season in order to be allowed to continue on to the summit. 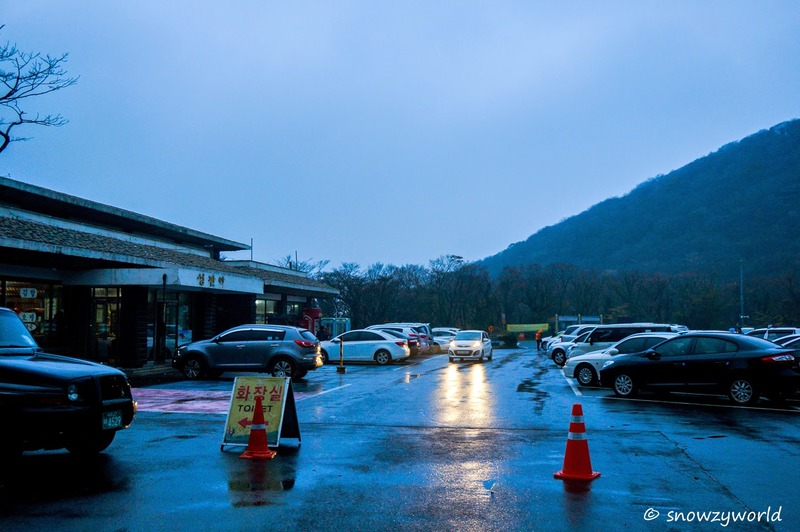 At Jindallaebat shelter, there’s drinks and cup noodles for sale. Eating cup noodles after the climb in the cold weather was damn shiok! Instantly warmed your body. I felt the climb from Jindallaebat shelter to the summit is the hardest. Mostly rocks, slippery after the rain made climbing up more difficult and tiring especially since we were at higher altitude. 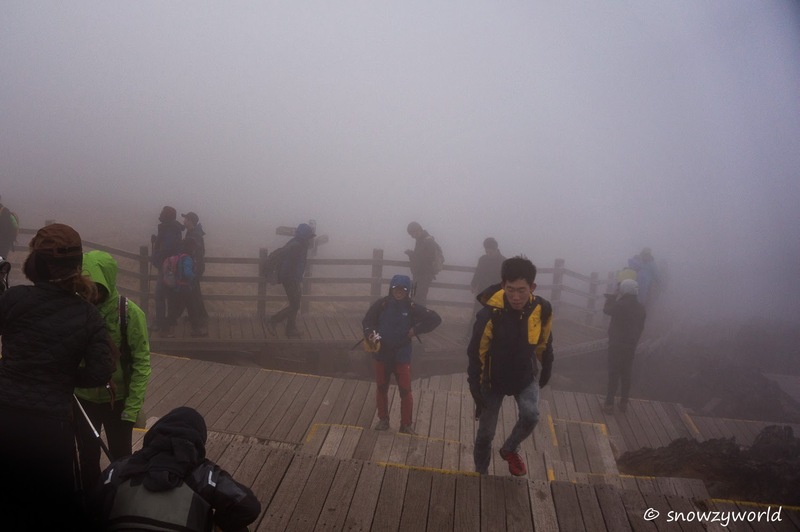 When nearing the summit, there are wooden planks as stairs. It was freezing cold and the wind was very strong. I have to couch low in order not to be blown away. Kenn on seeing my unsteady footing due to the cold wind had to rush to my side to shelter and stop me from being blown off. It was that bad. When we finally reached the crowded summit, it was just white and nothing except people and people. No view at all. It was very foggy and the whole place was frosted! So damn windy and cold that I don’t feel like moving at all. We had our celebratory soju and rush over to take the mandatory shot with the summit marker and off we head down from the summit. 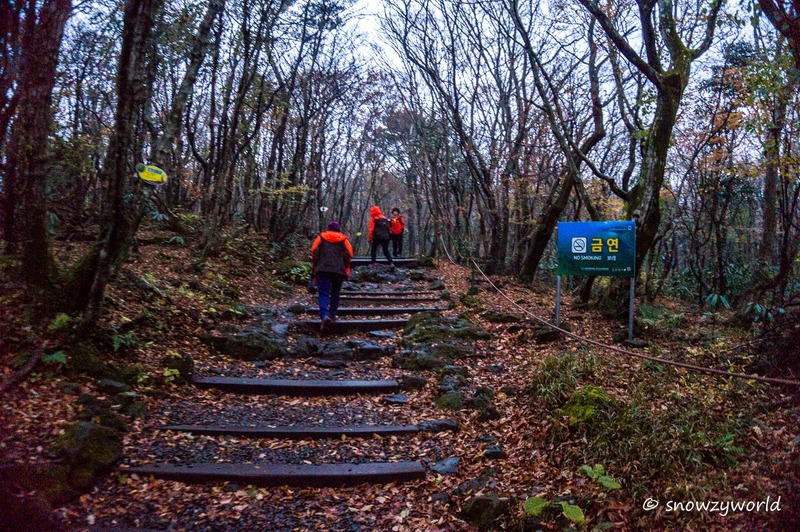 Some people took the Gwaneumsa trail down but since our car was parked at Seongnapak Visitor Centre, we took the same route back. The descent was another challenge. As the rocks were still slippery, we took cautious steps as we head down. Along the way we were greeted with the occasional sun but after Sokbat shelter, it started to rain again, no.. it was actually hailstorm. 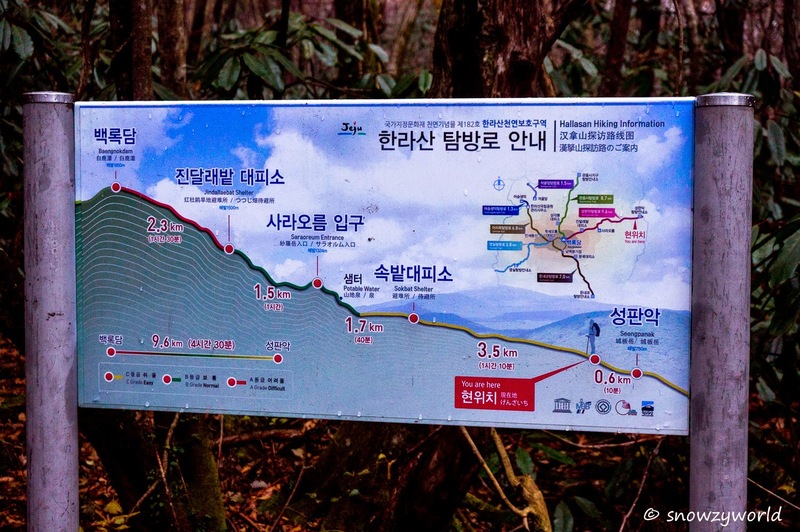 At 430 pm, we reached Seongnapak entrance and thus ended our 9 hours Hallasan climb expedition. It was a nice climb with mostly gentle slopes. The rocks can be a challenge especially during wet weather and I am glad that I brought along my trekking pole. I would highly recommend all to climb Hallasan when you next visit Jeju! Hi, I'm reading up about hallasan trails, and I happened to chance upon your blog. Its good write up and informative. 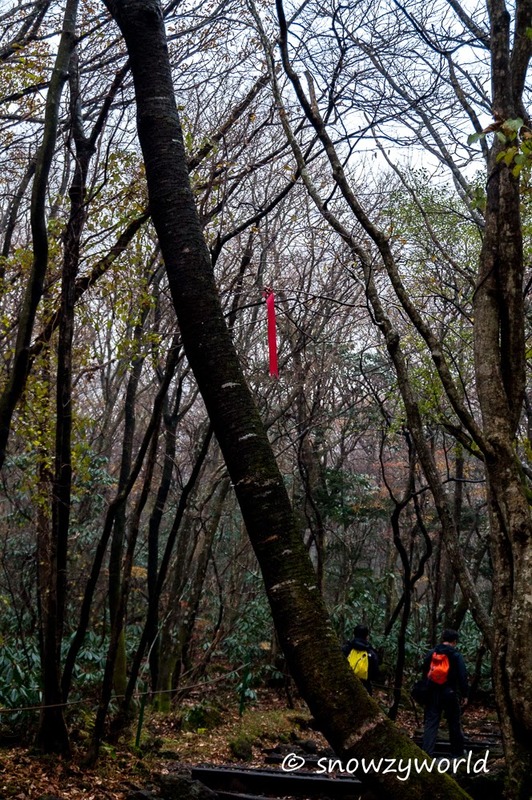 However I would like to ask if a person with no climbing experience would it be difficult for the seongpanak trail, or shld we be advised to the the other trail that leads to the 1700m shelter? 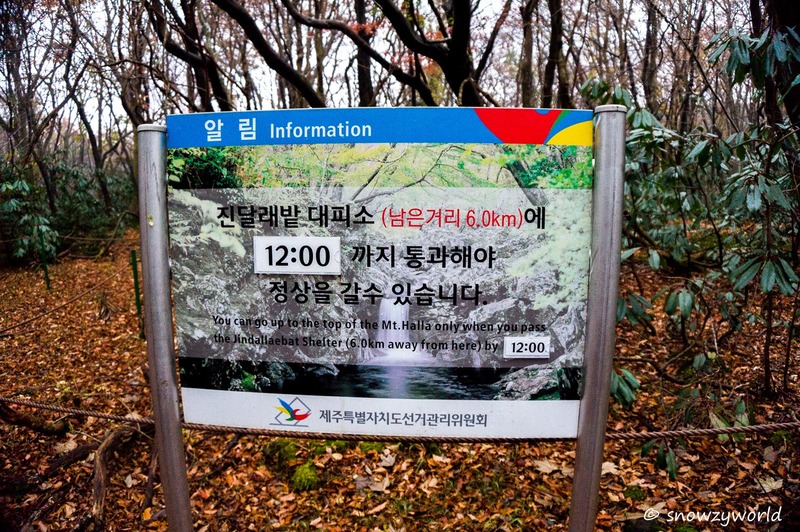 Aka yeongsil trail. 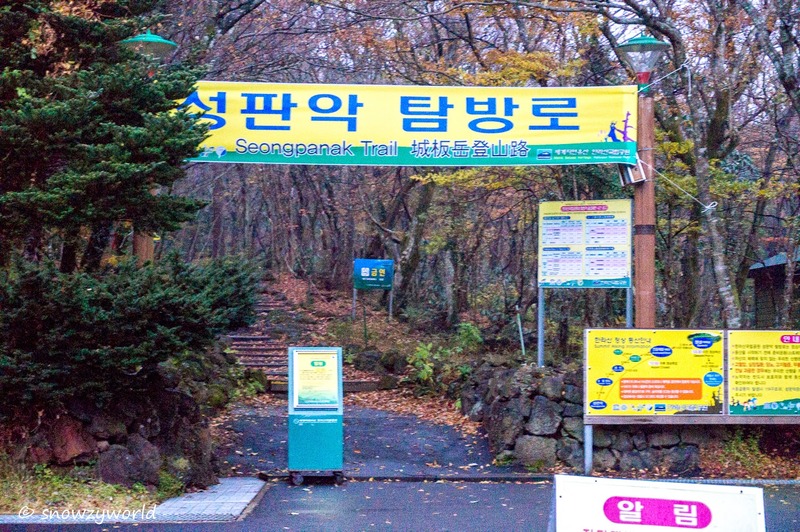 For person with no climbing experience, Seongpanak trail is do-able. 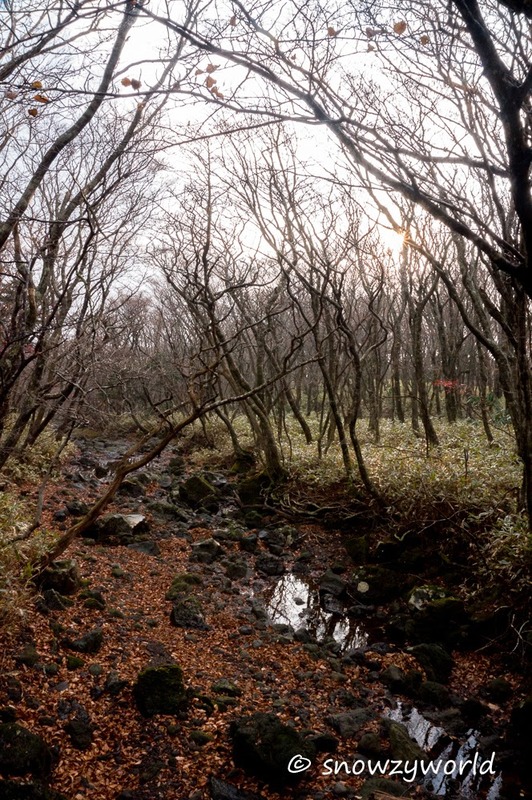 The ascent is gradual and trail are very well-maintained. The climb is not technical, so don't worry. Just wear proper shoes and attire. I am not sure about the other trail thou as I did not research them.